The country's first military-inspired obstacle race is back this October again and it promises an all new adrenaline treat for the fearless Guerilla Racers. The Guerilla Race will face the wilderness and off-track slopes of Timberland Heights on October 25, 2015 as it unveils its more gruesome class, the Guerilla Race Elite Category. The Elite Category with its 10KM course offers a more complicated and challenging route that even the bravest of the bravest will be thunderstruck. Lt. Col. Dennis Bumanglag, the Race Director of the Guerilla Race believes that the new category will surely surprise frequent Guerilla Racers. "We have been doing the Guerilla Race for quite some time now and honestly, many of our frequent racers prepare excessively for our races. They have been doing their homework, learning their lessons from the previous races and creating strategies for the next. So we decided to give them a little surprise with the launch of this new category," explained the esteemed director. Although the new category is designed for the technical and professional runners from the special forces of the military, it also welcomes those who just want to face a tougher challenge. And because the new category seeks to find the toughest Guerilla Racer in history, winners will be selected regardless of gender with only two divisions: individual and team division. But fear not, since the Elite Category promises a more stimulating and provocative experience, it will also provide better prizes for the victorious. 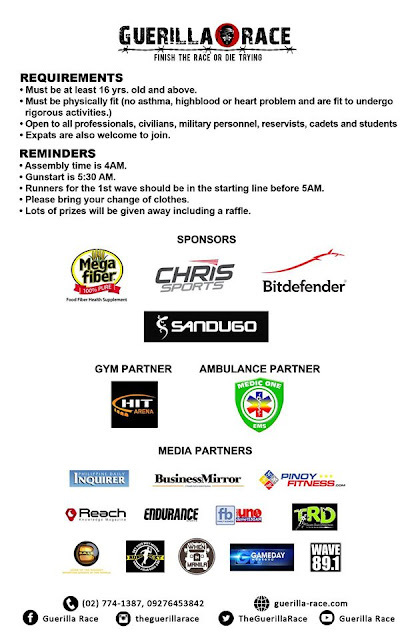 Aside from the Elite Category, Guerilla Race Warrior will also have its usual 5K Sprint and 10K Warrior Categories. Spirited racers will have a chance to join and compete via Individual or Team Division (with 3 to 10 members) in an all-male or all-female classifications. Just like previous Guerilla Races, the benefit race shall donate a part of the registration fees to assist the education of the orphans of our soldiers who sacrificed their lives for the service to the country. This year's chosen beneficiary is the Armed Forces of the Philippines Educational Benefit System Office (AFPEBSO). 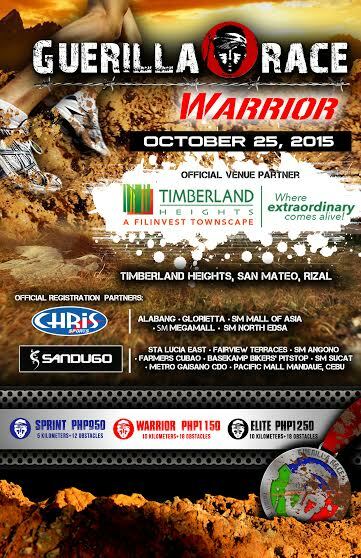 GUERILLA RACE® WARRIOR 2015 is presented by TN-Guerilla Race Inc. in cooperation with Timberland Heights (San Mateo, Rizal), Sandugo, Chris Sports and Halfprice.PH. It is supported by Doc Aid (Pocket First Aid), BitDefender Antivirus, Mega Fiber, Aquabest, Medic One (Ambulance Partner), and HIT Arena (Gym Partner) with official media partners Philippine Daily Inquirer, Business Mirror, Pinoy Fitness, Endurance, Team Run Direction, DZME 1530 Radyo Uno, Balls Channel, Runner Rocky, Sports Republic, Travel Plus, Reach Magazine, Gameday Weekend, When in Manila and 89.1 Wave. So brace yourself and get ready for a whole new level of gruesome action and high-pumping adrenaline experience with this year's Guerilla Race. To register, visit the nearest Sandugo Concept Stores and Chris Sports.